EA has joined the ranks of many other game publishers who are letting Sega distribute their games in japan. 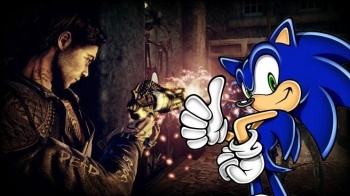 Sega and Electronic Arts haven't always seen eye to eye. In fact, back in the Sega Genesis era, it turns out that the former never gave the latter a dev kit, so EA wound up reverse-engineering their own. Nowadays, though, the two seem to be on better terms, as it's just been announced that Sega is going to start distributing EA's games in Japan. According to an announcement posted at Famitsu, the deal is set to begin in August, with Shadows of the Damned being the first new game that Sega will distribute (which is set to come out in the country on September 22nd). After that, EA plans to release Battlefield 3 and FIFA in the country. Of course, this isn't the only company that Sega handles distribution in Japan for. The publisher also takes care of games from companies like Arc System Works, Codemasters, and Cyberfront.